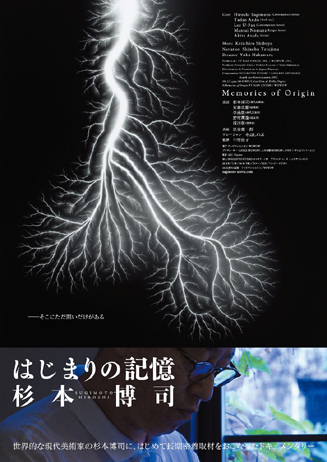 I saw a documentary titled はじまりの記憶, which features Hiroshi Sugimoto. I was so impressed by the movie. I've been thinking of him sort of weird and odd; his works always make me kind of uneasy. His photos blur and emit something doomful aura. I think he is, so to speak, a speculator. He surfs on a wave of modern art capitalism better than anyone and he's been releasing polemic works during decades. What I was impressed the best is his attitude toward his art; he insisted art should be scientific and computable, and in parallel, his art includes something supernormal things. He looks like a head of small factory when he's making a photo using artificial electric lightning. From such a earthy view point, the story reaches his first memoir about ocean, which is widen over the human-wide scale of memories. Anyway, I was stimulated by the movie a lot. I won't forget that influence from it and make it help myself for some of my work in the future.